Eastern Conference Finals series against Portland, and helped the Penguins advance to the Calder Cup Finals against the Chicago Wolves. The most obvious belonged to the Wilkes-Barre/ Scranton Penguins. They were down three games to two in their Eastern Conference finals series against Portland. The Pens fell behind 3-0 in Game 6, but rallied for an improbable overtime win. Wilkes-Barre/Scranton then took Game 7 to advance to the Calder Cup finals. The second rally was of a more personal nature, easy to overlook for anyone who wasn't scouring the side of milk cartons. Pens rookie wing Nick Johnson was back in the team's lineup. While this was hardly stop-the-presses news, it said a lot about the toughening skin of Johnson and the gumption of Wilkes-Barre/Scranton head coach Todd Richards. Johnson, you see, had been a healthy scratch and locked away in Richards' doghouse since Game 1 of a second-round series vs. Philadelphia on May 1. That was a disappearing act of nine long games for Johnson, then a re-appearance when his team's season hung in the balance. "As long as you have good habits, you can't overburden yourself with too much thought," Johnson said of parachuting back into the pressure cooker. "Once it's time to play a game, you go out and play. You can't really worry, be nervous." At 6-foot-2, 200 pounds, Johnson, a third-round pick by Pittsburgh in 2004, has helped give the Penguins a solid second-or third-line power forward. "He's got a decent set of hands, so he can make plays in the offensive zone," Richards said before the finals started. "He has some ability that not everyone is blessed with. Since he's been back in, he's done a great job for us." 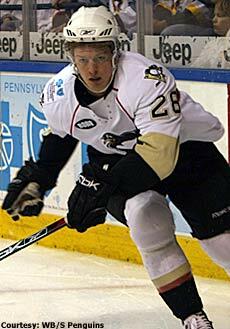 Johnson joined Wilkes-Barre/Scranton at the end of his senior season at Dartmouth, and produced one assist for the Penguins in four regular-season games. He thought he might have known what he was in for during the playoffs. He didn't, and that lesson hit home during a first-round game against visiting Hershey. Johnson took a shift immediately after the Penguins had popped in the goal, and when the score was announced he couldn't believe what he heard. The place rocked so loudly that he swore the ice was moving. Johnson could move well, but that's true of just about everyone on the speed skating Penguins. Johnson needed to improve his quickness to win the smaller battles on the suddenly less-spacious pro ice surfaces. "The college game is all skating. The games have a lot of pace to them," Johnson said. "In pros, guys are quick, they take away your options better. If you are in the right position, you don't have to skate as much. In pro, it's not as much top speed. It's corner work and turning. I have to get a lot better to maximize my game." And be more consistent, too. Following the tried-and-true pattern of rookies, Johnson followed up his strong finish to the Portland series with a bit of a clunker in a 5-4 Game 1 Finals loss to the Wolves on May 29. He was a minus-3 and took a holding penalty that led to Chicago's winning goal as the power play expired. That's all part of the learning process, as painful as it might feel right now. It's not that Johnson coasted in college, but he certainly had a right to feel comfy. He played in every one of the Big Green's games for four seasons, 113 in all. Sis-boom-bah, Richards didn't care. After Johnson went pointless through his first six playoff games, he told his prospect to dust off a seat in the stands until further notice. "It wasn't that he was bad. It's just that he wasn't as good (as he could be)," Richards said. "For me, as a coach, you see that all the time. You see that first push (from a newcomer) and then guys become comfortable." Even more challenging was that Johnson was going to have to earn his way back into the lineup through the drudgery of practice instead of the adrenaline-fueled excitement of games. It's a good thing, then, that Johnson knows a little bit about rolling up his sleeves and getting the job done. the Pittsburgh Penguins in the 2004 NHL Draft. Johnson's father, Kevin, is an emergency room doctor in Calgary. When people come to the hospital - sometimes badly injured - Kevin is the one who meets them first and assesses their needs. Nick saw the importance of focusing on the bigger picture instead of getting squeamish about the immediate details, like gashes, broken bones and various exposed organs. Spilling that wasn't necessary to get his minutes back, but plenty of sweat flowed in practice. Johnson put out enough guts and energy during workouts to make a potentially risky reinstatement decision from Richards a no-brainer. "I would have loved to play. But it's good that I didn't. I learned I can't take days off," Johnson said. "I just started practicing really hard. I was in no position to complain. We're trying to win a championship. He (Richards) has to put the best (team) on the ice that he can." If only all of Johnson's problems could be solved with elbow grease. Johnson has been the team's rookie captain since he got there. Such stints are only supposed to last a month, but no matter. Beyond the usual rookie chores, rookie captains typically have responsibilities like taking head counts on the team bus and getting movies for road trips. Oops. Johnson breaks from the hockey norm in that he doesn't always have to feast on a steady cinematic diet of action pictures or fraternity row comedies. That's commendable, but he fell into hot water with his buddies when he picked up the somewhat touchy-feely movie Half Nelson for a recent trip. "I go to the movie store thinking I'm going to get something good, and everyone hates it," he said. "They thought it was boring. It (his selection skills) is getting a little better. It's hit or miss sometimes." "I'm not guaranteed anything. It's kind of nerve-wracking thinking you might be out of the lineup if you make a mistake," he said. "You just have to go with it."